This is an oscillator designed so the output frequency can be changed by applying a voltage to its control port, also known as its tuning port. 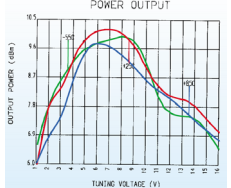 Frequency versus tuning voltage performance for a given VCO. This is usually graphed as frequency vs. voltage. Variation of frequency with temperature at a fixed tuning voltage. This refers to the fact that for a given frequency voltage characteristic, the frequency is single-valued at a given voltage, and vice versa. The slope has the same sign across the tuning range. This is the slope of the tuning characteristic and is expressed as frequency change per unit voltage change (MHz/V, etc.). Tuning linearity is the deviation of the frequency versus tuning voltage characteristic from a best-fit straight line. It is sometimes called tuning nonlinearity. The slope of the tuning voltage characteristic at a given tuning voltage is the tuning or modulation sensitivity. The difference in modulation sensitivity at two operating tuning voltages is the delta modulation sensitivity. This is the time required for the output frequency to settle to within 90 percent of its final value after applying a step change in tuning voltage. 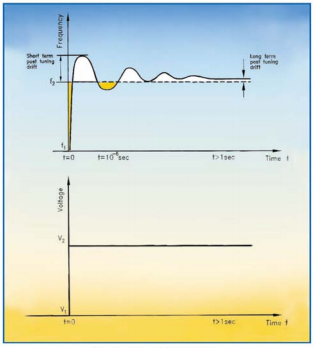 The settling time or tuning speed is related to the tuning or modulation bandwidth. The total equivalent capacitance seen at the tuning port of the VCO. This capacitance is a function of the DC component of the test signal applied to the tuning port, and depends mainly on the varactor diode capacitance vs. voltage characteristic. The modulating frequency at which the frequency deviation decreases to 0.707 of its dc value. This is an inverse function of the tuning-port capacitance, and it usually depends also on the modulating source impedance, which is typically 50 ohms. The application of a step voltage causes the VCO to change its frequency from an initial f1 value to a final f2 value. The frequency f2 will settle to a stabilized value after some time. Post tuning drift is the frequency error compared to a final stabilized value at a specified time after the application of a step voltage. Expressed as frequency error in Hz, kHz, etc. as illustrated in Figure 1. This is the frequency drift of the VCO with temperature at a fixed tuning voltage, and may be expressed as a relative percentage change per unit temperature, or as a frequency change per unit temperature. The fundamental sinusoidal frequency output of the oscillator measured into a 50-ohm load, expressed in dBm. The maximum to minimum power variation (expressed in dB) observed over the specified frequency range in a 50-ohm system at a given temperature. Variation of the output power from the average output power, expressed in dB. The changing of output frequency corresponding to a given change in the supply voltage at a fixed tuning voltage (expressed in MHz per volt). Frequency variation caused by changes in the impedance of the output load. It is usually specified at a load return loss of 12dB and all possible phases, and is expressed in MHz peak-to-peak. Harmonic levels are measured relative to the fundamental signal (the"carrier") and expressed in dB referenced to the carrier (dBc). Spurious spectral components are unwanted and non-harmonically related signals present at the oscillator output. Spurious response is usually expressed in terms of dBc. 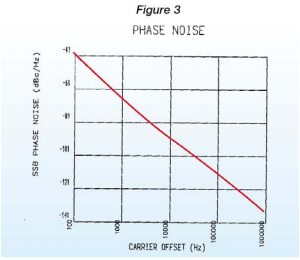 Single side band phase noise in 1Hz bandwidth is measured relative to the carrier power at a given offset from the carrier frequency and is expressed as dBc/Hz, as illustrated in Figure 3 (Mini-Circuits models POS-1025 or JTOS-1025). For more information see Application Note relating to VCO Phase Noise. One of the sources of noise associated with solid state devices, the amplitude of which varies inversely with offset frequency. It is also referred to as 1/f noise. where f is the offset frequency from the carrier, and SC(f) is the single-sideband phase-noise power spectral density function. A figure of merit often used in describing the sharpness of a tuned circuit response. A high-Q circuit has a sharper response, and vice versa. Applied to a VCO it refers to the frequency-determining resonator, and high Q improves noise suppression. A diode operated in a reverse biased condition providing a junction capacitance that is a function of the applied reverse bias voltage. A feedback circuit in which the VCO frequency and phase are locked to the frequency and phase of a stable reference signal. A system that generates any one of equally spaced frequencies within a given band, referenced to a stable frequency. A circuit which compares two coherent RF signals and generates a DC output voltage or current that is a function of the difference between the phase of two signals. This is a constant for a given device and given input signal conditions, and is measured in volts per radian or amperes per radian. A method of describing the transfer characteristic of a circuit or system where the gain function as magnitude in dB and phase shift is plotted on a logarithmic frequency scale. The gain at which the magnitude of the open loop gain is equal to 1 (or 0 dB). The frequency at which the magnitude of the open loop gain crosses the 0dB point. The loop filter is generally a low pass filter which filters the output of the phase detector and determines the noise characteristics of the VCO. If the phase detector generates a current output, then the loop filter will integrate the output signal from the phase detector into a DC voltage to drive the VCO to a specific frequency. The loop filter may take different forms, a typical one being a lag/lead network.